The Iroquois or Haudenosaunee Confederacy was formed by the Peacemaker and his spokesman Hiawatha to bring together five separate nations in the southern Great Lakes area. The treaty was sealed by symbolically burying weapons at the foot of a Great White Pine, whose 5-needle clusters represented the original 5 nations Mohawk, Oneida, Onondaga, Cayuga, and Seneca. The reverse design of the coin features the Hiawatha Belt, which is a visual record of the Haudenosuanee. The Great White Pine is shown as the central figure of the belt, also representing the Onondaga Nation. Four square symbols to each side represent the remaining four nations of Mohawk, Oneida, Cayuga, and Seneca. The belt encircles five arrows, showing the strength in unity. The reverse was designed by Thomas Cleveland. 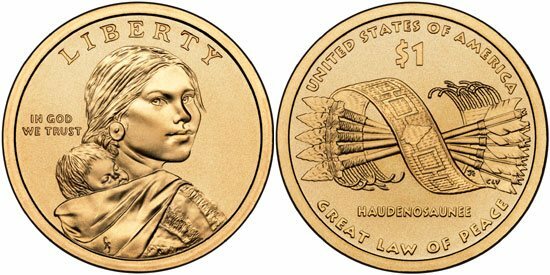 On the obverse of the coin was the portrait of Sacagawea and child designed by Glenna Goodacre. This design is used throughout the entire series in common to accompany the annually rotating reverse design. The 2010 Native American Dollar was first made available by the United States Mint on January 4, 2010 through their Direct Ship Program. Quantities of 250 coins could be ordered at face value for the purpose of introducing the coins into circulation. The US Mint offered numismatic rolls of the coins starting on January 22, 2010. A launch ceremony for the coins was held on January 25, 2010 at the Smithsonian Institution’s National Museum of the American Indian George Gustav Heye Center in New York City. The United States Mint Director was on hand for the event. Children 18 years of age and younger received a newly minted Native American Dollar for free. Others were given the opportunity to exchange currency for rolls of the new coins.